The Cricket Star slot comes packaged in a classic five-reel layout with 243 ways to win. For those who are unfamiliar with this payout system, it means you can win with matching symbols in any position from left to right – unlike traditional pokies paylines, where most pictures only pay when they join up in specific patterns. And because there are five reels with three rows of symbols each, we get 3 x 3 x 3 x 3 x 3 = 243 possible winners per spin. Another great thing about all-ways-wins pokies like Cricket Star is that you can cover every potential payout with the minimum stake. This particular game caters for most Australian pokies players with three coin sizes (0.01, 0.02, 0.05) and the option to bet up to 10 coins per spin. Thus, a $0.50 minimum bet will undo even the tightest of purse strings, while the $25 maximum bet will keep all but the most voracious VIP hi-stakes gamblers interested. 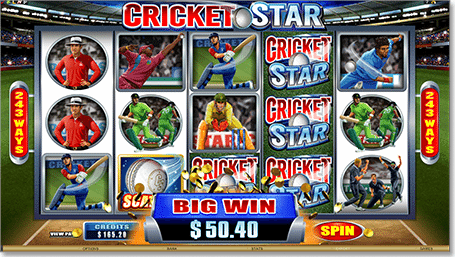 The Cricket Star real money slot features more than 40 wild symbols, which come stacked on reels three, four and five during the base game. These stacked wilds are especially useful in 234-ways pokies, as having whole reels of substitutes gives you the potential to put together multiple five-of-a-kind combinations at once. There is also the unique Wild Wickets feature, which can occur at random during the base game. On any given spin, a set of stumps may appear in front of reels two, three and four. One of the pegs will get bowled over, thus turning an entire reel wild for a single spin. One of our favourite online pokies features here at PG is the scatter symbol, and Cricket Star boasts a pretty darn good one. This multi-faceted feature pays from any position on the board, so you don’t even need to get them on consecutive reels from left to right. Better yet, scatter payouts are multiplied by the total bet, whereas all other wins are calculated according to coins wagered. For example: on a $5 bet using five 0.02 coins, all scatter wins would be multiplied by the total $5 wager; each regular payout, on the other hand, would be tallied in relation to the coin bet ($0.10). Cricket Star scatters also pay in addition to any standard payouts on the same spin – so if you land a couple of scatter feature symbols and one or more normal combos at the same time, you get paid for both. While these bonus spins cannot be retriggered while the round is in motion, you can boost your wins thanks to a special multiplier feature. For every consecutive win you get through Rolling Reels (more on that below), the universal multiplier increases – first to 2x, then to 3x, all the way up to a very lucrative 10x multiplier. As long as you keep hitting boundaries with Rolling Reels, the multiplier keep going up until it reaches x10. As soon as you swing and miss, however, the multiplier will reset and you will start again at 1x on the next spin. Rolling Reels is an ingenius concept which allows you to rack up multiple consecutive wins on a single spin. Whenever you strike a winner, all the paying symbols will vanish and be replaced by new ones; and if you get more paying combinations from these new symbols, those winners will also disappear and another fresh batch will slide down. The process repeats until there are no more winning combos on the board, so it’s like getting several spins for the price of one. This special Microgaming pokies feature is active in both the Cricket Stars base game and the free spins bonus round, where they are especially useful. The only time the Rolling Reels don’t appear is during the Wild Wickets feature. The Cricket Star pokie game is everything you would expect from a new Microgaming release. You don’t even have to be into cricket to enjoy it. The graphics and gameplay are as solid as ever, the bonus features offer both great entertainment and big cash wins, and the $25 bet limit is great for casual and low-budget punters while giving just enough incentive for the high-stakes pokies players out there. We really like that the Rolling Reels stay on during free spins, too. All in all, this a game which has something to suit most real money pokies enthusiasts. You can play Cricket Star online using Australian dollars at Royal Vegas Casino – our top-ranked online casino for Microgaming video slots.